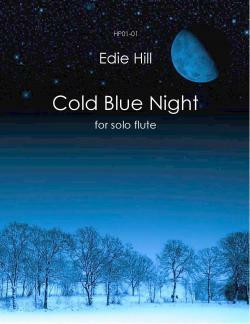 Cold Blue Night for solo flute came into being shortly after I moved to Minnesota and braved my first upper-midwest winter. It was inspired by the kind of Minnesota night when the sky is dark, dark blue, the temperature is well below zero, and a full moon lights the snow with a pearl-blue glow. It is beautiful, pristine, yet cruel and dangerous. This piece explores the harshness and the soft beauty of a frigid mid-winter night.